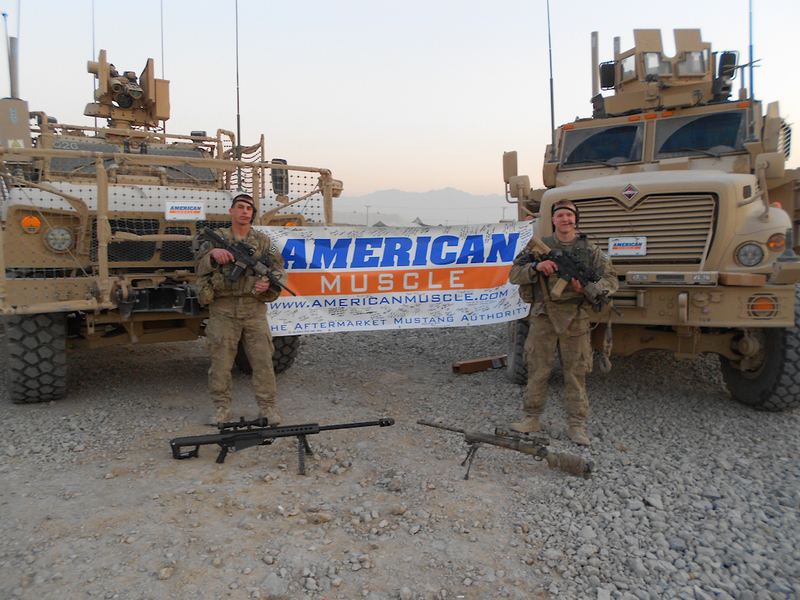 AmericanMuscle.com Shows Love to US Troops in Afghanistan! We’ve always had a ton of respect for the troops that serve our country. We’ve been helping send care packages, hooking up our customers with a military discount and even donating proceeds from our annual car show to Homes for our Troops and the Wounded Warrior Project. As great as that is, sometimes it’s just nice to hook up customers who serve our country directly! Hi my name is Andrew M. I am in the United States Air Force and I am currently deployed to Afghanistan. 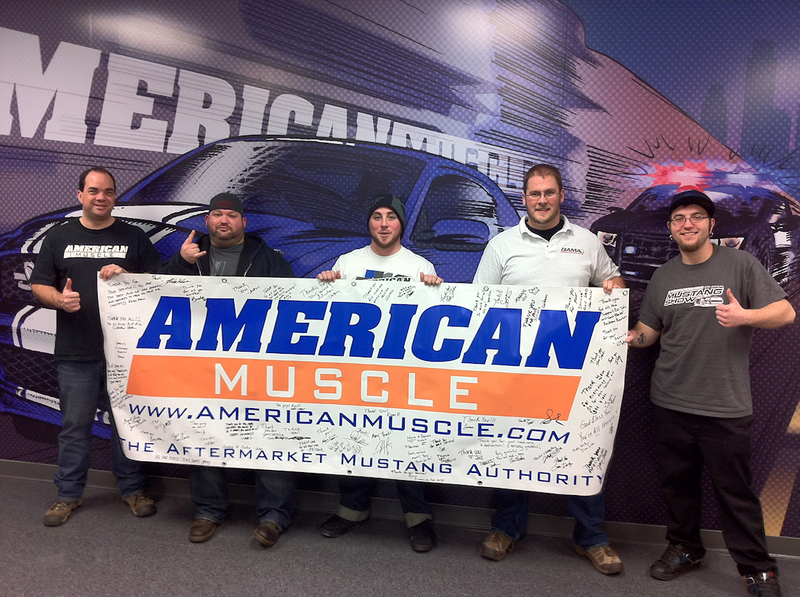 I just wanted to say thank you for all the great products and great deals that your website provides to us mustang owners. I cannot wait to get back home and drive my 2011 5.0 Mustang. But before I can do that I have to visit your awesome website and get some new parts to put on when I get home. I visit your website almost daily looking for stuff I want to put on my car. I remember seeing a few photos on your website a few years ago where troops overseas would put some AmericanMuscle plates on their Humvees and they sent them to you, I always thought that was the coolest thing. So when i finally get the chance to order some plates from your website I am going to put them on some of the US Military’s Latest vehicles, such as the MRAP MATV which is a almost 30,000 pound vehicle, and is basically a Humvee on steroids, with camera mounted machine gun on top. And the other is an MRAP Maxx Pro Plus which is a 50,000 monster that can take any bomb that they try to blow it up with. Well to conclude my email, I just wanted to say thank you for all the awesome products and support you guys give to keep us mustang lovers going. I will send pictures soon and I hope you guys will enjoy them as much as I will! This photo is of me and my partner, I am the guy on the right. We are Advanced Designated Marksmen for the Quick Reaction Force here at Bagram Airfield, basically when something bad happens or somebody is in trouble we go out and help them. I also chose to have two of our vehicles that we use in the picture because they are amazing pieces of machinery and truly are “AmericanMuscle” at is finest! Thank you again for the care package and the awesome banner, it was very heart warming to see that all those people who don’t even know me, took the time out of there busy day to sign the banner. Please thank them for me, from the bottom of my heart. Previous Entry Accel-erate Your 2011+ Mustang’s Horsepower with Coil-On-Plugs! Next Entry VIDEO: Does Our 2012 Boss 302 Mustang Sound Insane or What? !